Ruby and Chey Miller Stories - Do Basenjis Shed? 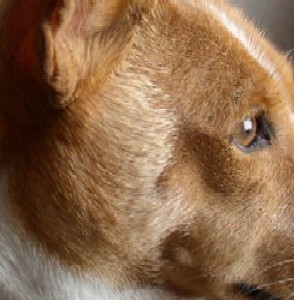 One of the oft-touted characteristics of the Basenji is that it sheds very minimally. Yet, coming into her second spring, my Basenji's sleek, silky coat suddenly began to look downright scruffy, as though she had spent the winter hobnobbing with a colony of wool moths! Worse, wherever she walked, cotton candy clouds of "strawberry frost" old lady hair swirled in her wake. It settled under the kitchen table. It collected in clumps on the living room rug. It rose toward the ceiling on vernal sunbeams when company came to call. As it turned out, Ruby's thyroid was fine. Whew! But, then . . . what's up with all this hair that Basenjis aren't supposed to shed?! The short answer is that SOME Basenjis shed minimally, while others have a heavier undercoat and shed a LOT! The variation is primarily genetic, but the undercoat is also influenced by environmental factors, such as whether the dog lives where winters are cold and whether it spends a lot of time outdoors. Although you may hear otherwise, ALL Basenjis have an undercoat, however light; part your Basenji's hair and you will see some very fine, wispy hairs beneath the stiffer, shiny outer ones. As seen in the diagram, a canine hair follicle supports one central guard hair and as many as five lateral ones. It also supports from seven to twenty secondary hairs. The guard hairs are coarse, while the secondary hairs—the undercoat—are fine and soft. Hair growth is cyclical: there is a growing period, a period of transition, and a resting period. The length of each period of each hair depends on the age of the dog, the location on its body, the dog's breed and gender, and environmental and pathological factors. In other words, the cycle is determined by light, temperature, genetics, nutrition, hormones, and overall health. The growth rate of hair is at its peak in summer and ebbs in the winter. As much as 90% of hair follicles may rest in winter, compared to 50% in summer. 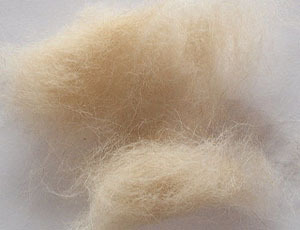 The normal, routine replacement of hair in a healthy dog is in a random pattern, with neighboring follicles in different stages of the cycle. Obviously, a dog with a thicker undercoat has more hair to shed and it will be more noticeable when it happens! Now we understand that if your Basenji is shedding heavily, and the season is changing, as long as there are no other "symptoms", there is no reason to be alarmed. It is perfectly normal and healthy for a Basenji to go through a seasonal moulting. You may have to vacuum more frequently, but the season doesn't last that long. Besides, your Basenji is worth every hair you have to pick off your dress slacks, and after a while you won't even notice them floating in your coffee. 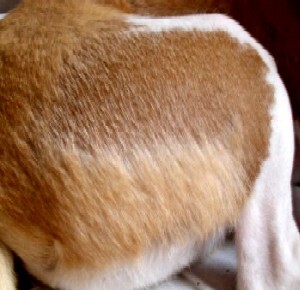 Regular grooming while your Basenji is "blowing coat" will go a long way toward managing the nuisance shedding. Some people use a grooming "stripper" to remove the loose undercoat, or make their own by forming a hacksaw blade into a loop and tying the ends together. Some recommend using a pumice stone. Each of these tools will remove loose hair when stroked in the direction of the fur, but they can also damage the coat by breaking or tearing the cuticle of the attached hairs. Because the torn cuticle is barbed, it "knits" with neighboring hairs to give the coat a temporary "finished" look. In actuality, these rough methods weaken the hairs, causing them to lose moisture. The coat becomes dull because the damaged cuticle loses its gloss. I prefer to use a nubby rubber curry brush or a wire "slicker" brush. I often have to brush gently two or three times a day when the shedding is at its heaviest. And, oh, gee, how Ruby hates all that extra attention! No more kisses on this cheek until I can do it without getting a mouthful of undercoat! * Thanks to Bill VanWyck, Owen Sound, Ontario, Canada for permission to use this diagram, and for sharing his wealth of knowledge on the subject of canine hair.